The Christmas Season is approaching and we are all trying to think of the best gift to give someone. Let me help, an Aqua City Membership will be the perfect gift. It will allow an individual or family to have fun all summer long! You will see the advertisements for Thanksgiving Day, Black Friday, Small Business Saturday, and Cyber Monday where you have to hurry in to save a little money. You don’t know if the price you pay is a bargain or not. 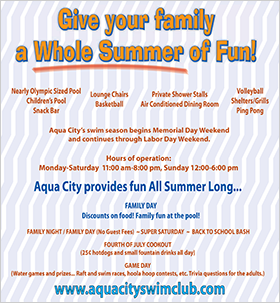 Here’s a bargain for you, you can get the Aqua City Membership Holiday Special and save, save, save! You can save $143.10 by purchasing the Aqua City Christmas Special Package. Unlike some other sales, this special price is good through Christmas Day. Just stop by the office to purchase one. Some of the events we have planned for next summer are Super Saturday, Family Night, Independence Day, and GAME DAY. So get the trivia knowledge and energy together and bring the family on out for some fun in the sun. We look forward to seeing everyone next summer!